D.R. Harris is London's oldest pharmacy. For over two centuries this family business in the center of men's Clubland has served the gentry and the court of St. James. They hold the Royal Warrants to Her Majesty the Queen and HRH The Prince of Wales. D.R. Harris specializes in shaving products, aftershaves and colognes, and a wide range of unique skin care items. 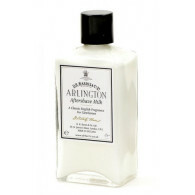 The Arlington range (Citrus, Fougere, Rose and Musk) is one of their oldest lines. Cucumber and Roses – Over 100-year-old product is a light moisturizer, primarily for women.